Hope everyone has a wonderful Oscar Sunday. Had a blast watching the Independent Spirit Awards yesterday and if you get a chance to catch the replay, look for the afternoon's funniest joke that I can't even begin to print here which came from presenter Dustin Hoffman involving Javier Bardem and Philip Seymour Hoffman. Juno, The Lookout and Once were big winners receiving the awards for Best Feature Film, Best First Feature and Best Foreign Film respectively. Okay, enough news-- onto our most recent poll. While it was probably the least popular poll so far, I was thrilled that Bogie and Bacall clocked in at number one and would agree with most of the results but I was shocked that Newman & Woodward came in last. 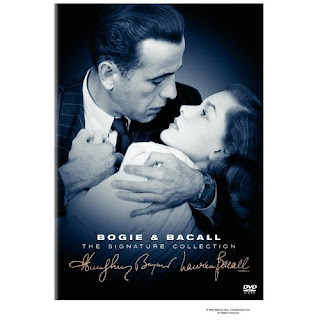 This could be due to the fact that although they're a lengendary couple in real life, their films together didn't quite sizzle like Bogie and Bacall's, save of course for the sultry Long Hot Summer. For our next poll, I've decided to go the escapist route and also offer something for my incredibly loyal and largely male readership in asking you guys to choose your favorite James Bond. While it seemed strange to include Lazenby (who only starred in one), Dalton (who has become the source of jokes whether fair or not) and Craig (who may be too new), my parents raised me right, so 67's Casino Royale spoof aside, I didn't leave out a single official Bond. May the best Bond win. Any last minute Oscar predictions? I used to conduct informal polls and make wagers with family and friends but over the past few years, I've felt that they've become pretty predictable. However, I woke up this morning with the strangest feeling that Juno may do quite well so we'll see but logically my brain still tells me it's No Country's night. Although I'm reminded of some vote splitters of the past (hello Shakespeare in Love) with surprising results so we could be in for one interesting evening.